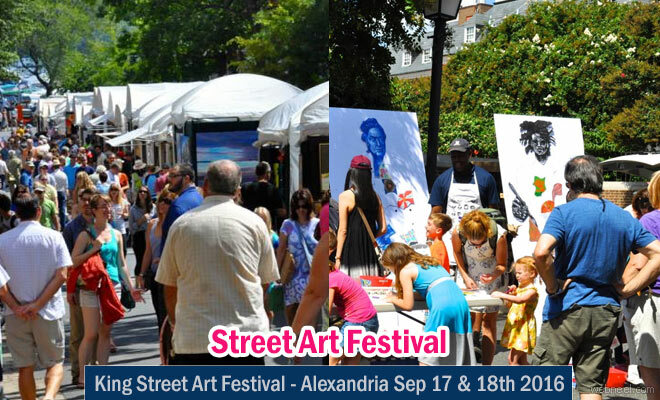 Alexandria in USA is considered as a community which has deep roots in creative culture and King Street Art festival is an annual celebration, where the neighborhood is also decked up with vibrant street art pictures. The Walls between King street, Washington and Union street is all geared up to accommodate artwork of more than 250 artists from around the world. You can expect atleast six blocks with vibrant street art. Since it's a two day event, visitors can also visit the beautiful artistic Alexandria, by staying at some hotels in King street to totally immerse yourselves in the vibrant neighborhood. What to expect during this festival? There are atleast 82 art studios and visitors can also catch their favourite artists at work(live). A creative DIY station will also be set up to enjoy a hands on experience. Saturday, September 17, 10 a.m. – 7 p.m.
Sunday, September 18, 10 a.m. – 5 p.m.